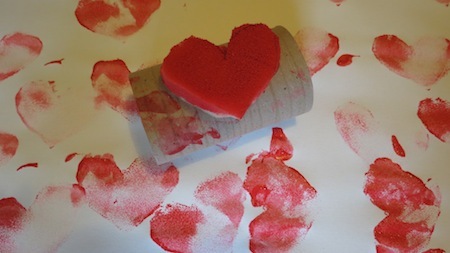 If you are looking for ways of making valentines day hearts that are super easy you're in the right place. Perhaps you've got young preschoolers or have not got so much time. If so, these ideas for printing hearts are for you.....! This is a super easy way of printing valentines day hearts. In fact, it's a perfect toddler craft, so if you have small ones at home let them get printing! 1. Bend the toilet roll in the middle so you are left with a squashed roll and a cute, round heart. 2. 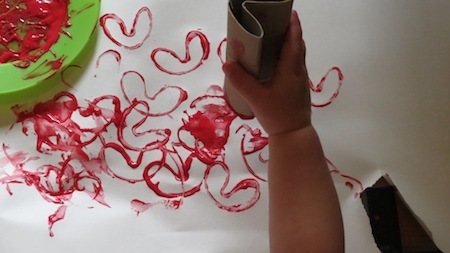 Spread some red paint on a plate and secure a large piece of craft paper in front of your child. 3. Let them start printing! 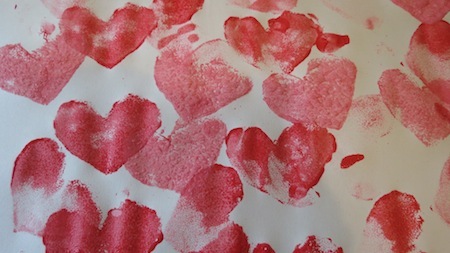 TIP: What about using the prints to make great kids valentine cards? 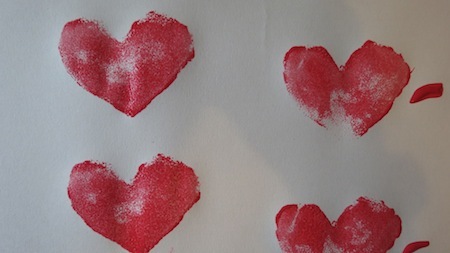 If the child is too small to make a card themselves you could cut some of the printed hearts out into a rectangle and glue it onto some white or red folded card stock. 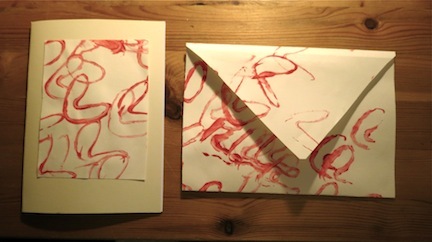 You could also make an envelope from the prints to send to a parent or grandparent. 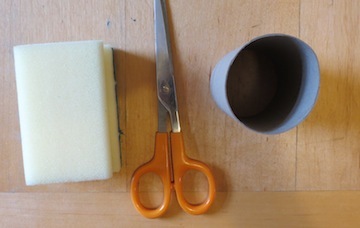 Simply cut a long rectangle and then slice the corners off at one end to make the envelope flap. Glue down the sides and put the card inside! This is another super easy way of printing valentines day hearts. 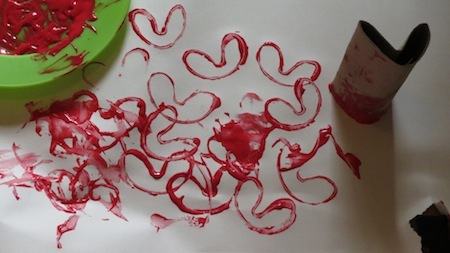 It requires a bit more coordination than the toilet roll printing above, but can be done by older toddlers. 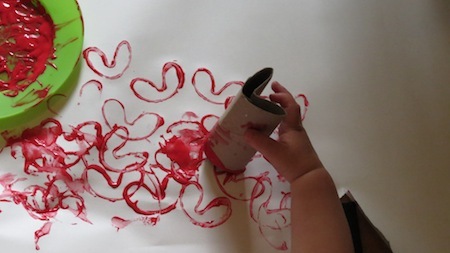 TIP: Why not buy some white banqueting paper, roll it along your table and get your kids to cover it with hearts? 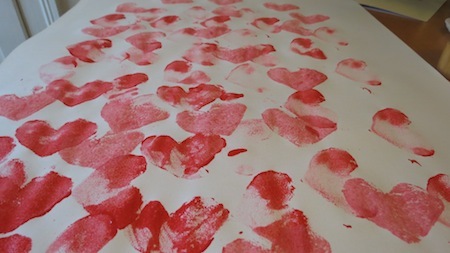 Once it's dry you could use it as a valentines day table cloth! 1. 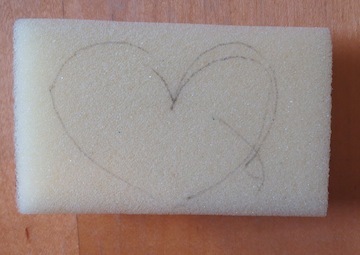 Draw a small heart onto your sponge and cut it out. 2. 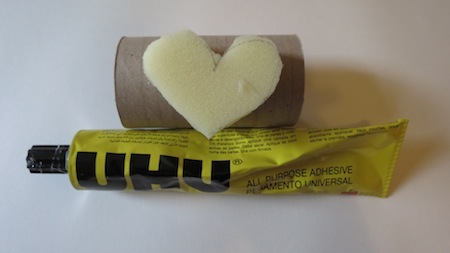 Glue your heart sponge onto the side of the toilet roll. 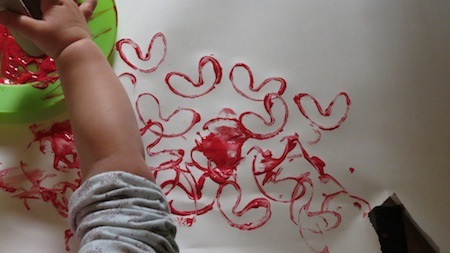 Cover a plate in a layer of red poster paint and get your kids into aprons! Adding some pink paint to the plate - they go so nicely with the red hearts! Our table cloth in production! The sponges print so easily and make such lovely hearts that they are ideal for covering a large surface area like a table!